The Ludlow Community Association took its name from the neighborhood elementary school — Ludlow Elementary School, at Ludlow and Southington, shown as a red star on the map. Many of the homes in the school's area are in Cleveland. This arrangement dates back to September 1912, when the school districts of Cleveland and Shaker Heights exchanged some areas. In 1987, in a major reorganization, Shaker Heights closed four elementary schools, including Ludlow. The building is now leased to PEP - the Positive Education Program and is used for its Greenview Day Treatment Center which provides educational and mental health services to children with serious emotional challenges. A satellite view of the center of the community, Ludlow Elementary School and its playground. 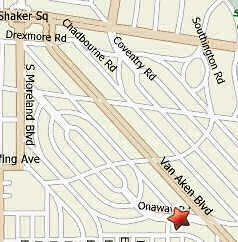 Note Van Aken Boulevard in the upper right corner. To view a full screen image (150Kb), click here. 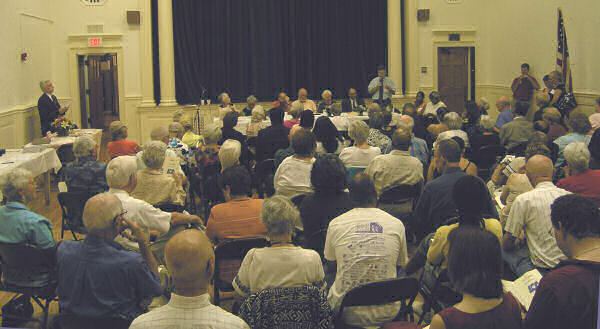 It was standing room at the September 8 meeting held at the old Ludlow School. Another story of the early days. Published in the Ohio Bell Magazine, probably in 1967. 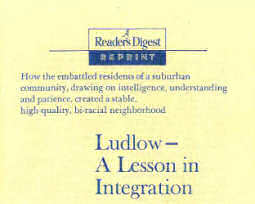 The September 1968 issue of Readers Digest told the Ludlow story. Former Ludlow School students talk about desegregation in the 1960s. For more on NPR's website, click here. Paul Mason. son of an LCA founder, now senior vice president - politics at ABC News, was executive producer of "The Reunion".